Look around – there are so many things happening around us that can be very discouraging. All around us families are crumbling – very discouraging. Our politics – extremely discouraging. An overall lack of respect – very discouraging. We can easily lose our motivation for being agents for God in this world. Agents who are pushing back the darkness so God’s light can shine through. Yep – we will become very discouraged by all the craziness around us if we take our eyes off of God and focus on ‘what’s wrong with the world’. In the Bible, Ezra tells us about the joy of the Jews as they resettled in Jerusalem after returning from their exile in Babylonia. They rebuilt the foundation of the temple and then held large celebrations. These parties attracted the attention of their enemies who offered to ‘help’ them build the rest of the temple. 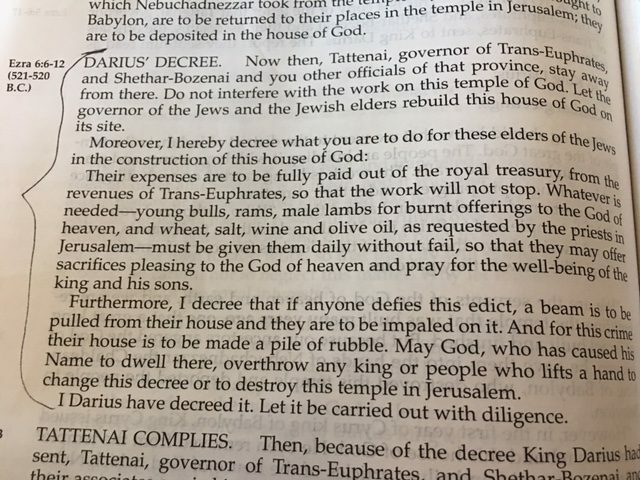 The Jews were smart enough not to accept their ‘kind’ offer so their enemies decided to find ways to discourage the Jews from finishing the temple. They tried to scare the Jews so they would be afraid to continue their building. They tried to make it very difficult for the Jews to continue to build. They even got the officials on their side, trying to stop the Jews from finishing the temple. But nothing stopped the Jews. Because they kept their eyes on God. He gave them courage to continue. He gave them the strength they needed to continue. 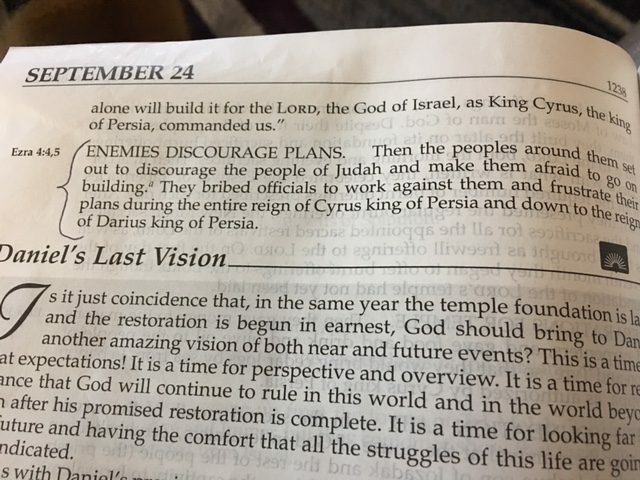 And God even worked it out so that the pagan Persian Officials paid for the rest of the temple’s construction as well as the first sacrifices that were made in it. There was no need for the Jews to be discouraged. God was in charge then – just like he is in charge today.